A murderer whose original trial was ruled unsafe because jurors consulted a ouija board has lost an appeal against his conviction at a subsequent retrial. Stephen Young, 46, was jailed for life at Hove Crown Court in March 1994 for shooting Harry Fuller and his wife Nicola at their Wadhurst home in 1993. The insurance broker, from Pembury, Kent, won the right to a retrial but was convicted again in December 1994. The Court of Appeal in London dismissed his appeal on Tuesday. 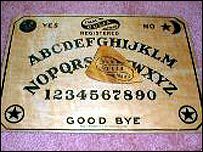 A retrial was ordered after it was revealed that four jurors at Young's original trial consulted a ouija board, which some people believe can be used to contact the dead. The jurors used an upturned wine glass on the board during a drinking session the night before finding Young guilty. The subsequent retrial took place at the Old Bailey in London.